I spent last week in Glacier National Park. A few years ago I completed my quest to visit all 50 states, and my ambition has refocused to visiting some of the National Parks I missed out on when I visited their state. This park was one I've heard about a few times, but I'm wondering why I haven't heard more after visiting it. It has to be one of the most beautiful places on planet earth. The park is broken into two parts in America, with a third section in Canada. The western portion is the most visited, and it has more forest, waterfalls, and water. The East side is more rugged with jutting peaks, visible (melting!) glaciers, and lots of wildlife. Not knowing much, I booked a room at Many Glacier Hotel on the East Side. The hotel was built in the day of the railroad, and modeled after Alpine villages to pull in American travelers. I've been to Switzerland once and the whole time, I really did feel like I was back in Switzerland. The weather was still a little chilly. Roads were still closed due to snow, in fact, they had an avalanche the week before, so a large portion of Going to the Sun road was closed. I'm never going to complain about chilly nights when I know I'm heading back to a Texas summer, so each evening I sat in the lobby and enjoyed the fireplace. The days we were there, no wind was present, so all of the lakes (and there are tons) had mirror reflections of the trees and mountains. Seriously, no picture can do it justice. I took a famous red bus tour as far the road would allow. The goal is to get from one side of the park to the other, and without an avalanche blocking the road, it would have worked, but what I did see was pretty stunning-no surprise. There were tons of waterfalls with all the snow melt coming down they were at their full potential. The reason why I like to risk those snowy roads in June is because it usually means that the animals are still hanging out pretty low in the valley-case in point-this bear and her cubs were hanging out in this meadow for a few hours. Another thing I read about the Glacier area was to try out the pies. I grabbed pie at the Park Cafe one afternoon-it was probably the best meal I ate while in the area. They were out of a lot of different flavors of pies by the time we arrived (huckleberry was my goal), but I don't think they make a bad pie. We took hikes (what Glacier is known for), boat rides out to see a few glaciers (the park is named for the fact that is was carved by glaciers, but if you want to see one of those sculptures, the goal is to visit in the next 15 years before they are projected to be totally gone). I spent a lot of time watching wildlife (you definitely want to hike with your bear spray....we saw more than a dozen animals-moose swimming, bears and their cubs, elk,deer etc). 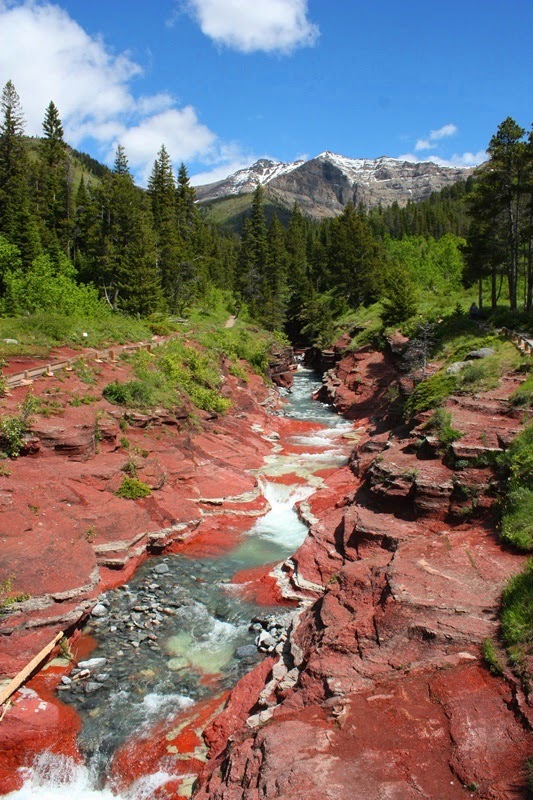 After 5 days we headed to the Canadian side of the park, Waterton. This time I stayed at the Prince of Wales hotels, another great railroad hotel with some really fun features, and a gorgeous view. I only spent about 24 hours here before I had to head home to Calgary, but I could literally not drive down a single park road without seeing a few bears. We even had to pause while two crossed the road. Red Rock Canyon was at the end of one road, which was such a neat site to see this red rock running through these gray mountains. I also accidentally came during their wildflower festival, so the wildflowers lined all the roads and were incredibly stunning. The best meals I ate the whole week were in Canada at the hotel and the town of Waterton. The best places to spot wildlife-the Many Glacier Area. Both hotels were awesome. There were tons of choices in the American side of the park, and Many Glacier was a little more isolated, and it took awhile to get from East to West, but the drive was no burden with those amazing views. I didn't know what to expect when visiting Glacier, but....it's one of the places I'll definitely go back, and I got to relax, which is not a word I use very often when I travel.